Today, yoga is a household word and practised by millions of people, yet few people know what yoga really is. The Sanskrit word yoga means 'union' and refers to the union of the individual self (jiva) with the higher Self (Atman) and, ultimately, with the supreme Self—Paramatman, or Brahman. More than simply a path, yoga denotes the goal of spiritual practice: union of the individual with the totality of cosmic existence, union of human life with the totality of Natural Law, or, in religious language, the Divine. Fifty years ago, when Maharishi Mahesh Yogi first began traveling around the world teaching his Transcendental Meditation technique, yoga was virtually unknown in the West. Time magazine ascribes the explosion of interest in yoga in the United States to Maharishi’s revival of the ancient Vedic wisdom in this country, crediting Maharishi with the enormous popularity of yoga today. In fact, Maharishi's Transcendental Meditation program is deeply rooted in the timeless wisdom of yoga, which is an aspect of the timeless Vedic literature of India. To most Americans, yoga means physical postures (asana), which tone the body and promote health and well-being. But this is just a small part of yoga as revealed in the ancient Vedic text, the Yoga Sutras of Patanjali. Maharishi explains that throughout the ages, Patanjali’s ashtanga yoga (literally, 'eight-limbed yoga') has been greatly misunderstood. While Patanjali clearly speaks of eight limbs of yoga, all interconnected just as the limbs of the body form one whole, commentators in India and the West have interpreted Patanjali’s yoga system as a series of eight steps, culminating in samadhi—the state of yoga, the Atman, the Self. Aspirants were therefore advised to begin at the bottom rung of this imaginary ladder and work their way up, slowly and tediously, until some day the goal of samadhi is attained. Among the eight 'steps' of this viewpoint, asana, or physical postures, has eclipsed the others and come to be known as 'yoga'. Maharishi’s profound insight into the Vedic wisdom turns this false interpretation of yoga most fittingly on its head! Using the analogy of a table, Maharishi explains that all the limbs of yoga are connected like the legs of a table. When you pull on one leg, the whole table follows. But some legs are easier to pull than others, and if you are wise, you will pull the simplest leg and accomplish the goal in least time and with least effort. The body is a heavy, stiff, material object. Bending the body, as in the practice of yoga asanas, requires patient effort and training and may take a lifetime to reach the 'superfluid' state of pure consciousness, or samadhi. But the mind is infinitely flexible. We all experience that in our thoughts or imagination, we can go anywhere in the twinkling of an eye; we can accomplish anything. The mind is ethereal, without substance. It is therefore very easy to 'bend' the mind in the direction of its source— pure, self-referral consciousness. With its innate flexibility, the mind naturally and instantaneously moves toward samadhi once it has learnt the proper technique. That technique is Transcendental Meditation, which stems from the ancient Vedic Tradition. The TM technique makes use of the mind’s natural tendency to seek greater happiness in order to turn the attention within and gently lead the mind to quieter, more refined levels of thinking, until it transcends even the finest level of thought and reaches a state of absolute silence, peace and inner contentment—a field of unbounded bliss. In this state of samadhi, all the fluctuations and diverse tendencies of the mind merge into unified wholeness, the yoga state of consciousness. Through this effortless, enjoyable practice twice daily, the meditator hits the target and the supreme level of yoga is achieved. The regular alternation of deep silence (meditation) and daily activity stabilizes the awareness in the state of yoga (samadhi), so that throughout all the changing phases of life, one remains unshakably established in the Self. At the same time, Maharishi’s Vedic Science promotes all the limbs of yoga through its specific approaches, including Neuromuscular Integration (asana); Neurorespiratory Integration (pranayama); the Transcendental Meditation and TM-Sidhi Program—an advanced Transcendental Meditation practice, which incorporates the three 'highest' limbs of yoga: dharana, dhyana, and samadhi—and, finally, through other approaches of Maharishi’s Vedic Science, which cover the areas corresponding to yama, niyama, and pratyahara. So even as all the limbs are automatically nourished* through one simple practice—the Transcendental Meditation technique—they are further enlivened through the specific approaches that comprise Maharishi’s holistic comprehensive Vedic Science. The current upswing of yoga around the world testifies to the growing awakening in world consciousness. Whether you are a devout yoga practitioner or an armchair yogi, through the Transcendental Meditation technique you can realize the ultimate goal of yoga—enlightenment. *Note: As stress and tension dissolve through the practice of the TM technique, the body becomes more flexible and begins to function in an optimal manner. 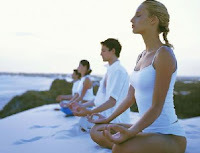 Breathing naturally becomes calm and health improves. The benefits of asana and pranayama thus naturally result from TM practice. Similarly in the field of behaviour, all the precepts and ideals of yama and niyama come to be spontaneously lived as consciousness expands and the individual grows in enlightenment. Behaviour becomes naturally evolutionary and life-supporting, nourishing and enriching to oneself and one’s surroundings. As for dharana—steadiness of mind and improved concentration are the natural result of practicing the Transcendental Meditation technique, rather than a prerequisite to its practice. TM practice itself is the ideal form of dhyana—meditation—which takes the mind from the surface thinking level to the source of thought, Transcendental Consciousness or samadhi. © Copyright 2009, Transcendental Meditation program of Asheville, NC. All rights reserved.